Digitalization takes customer experience to the next level – with multiple digital touch points, direct interaction and optimized service. Digital solutions can be used to couple your existing products with additional services, seamlessly creating an enhanced customer journey. 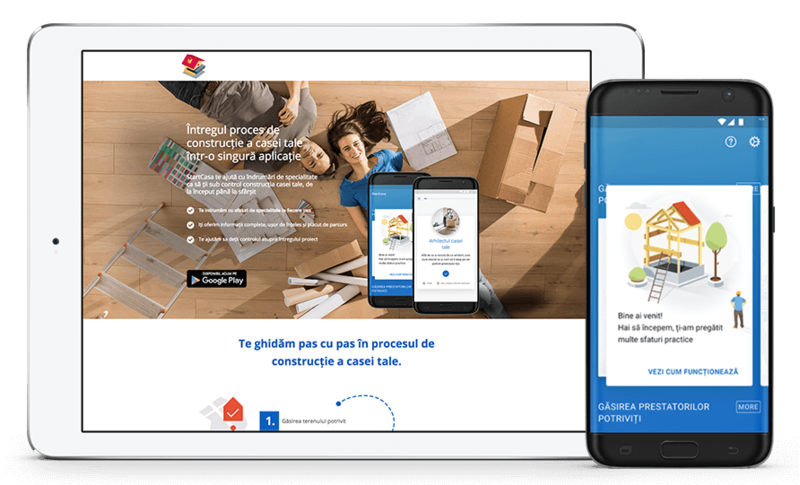 The app enables users to easily find essential information about home building. Each “lesson” has been developed by an expert, and concisely describes what home owners should expect during each building phase. Interactive questions help home owners to understand the information provided – in a fast and entertaining fashion. Exploratory interviews were conducted to identify target groups and their needs and pain points. Based on the relevant pain points, initial ideas for prototypes (MVPs) were developed. Here, the key pain points were poor understanding of construction phases, and challenges communicating with service providers. Different prototypes were tested – with content for supporting home owners during building phases, and simplifying contact between service providers and home owners. Implementation and market launch of a validated MVP: Mobile app with broad content supporting homeowners. Continuous development and optimization of the mobile app. Leading global manufacturer of construction materials operating in more than 90 countries, with over 115,000 employees – generating more than $28 billion in sales.